Packington Free Range is a family run business based in Barton-under-Needwood, Staffordshire. 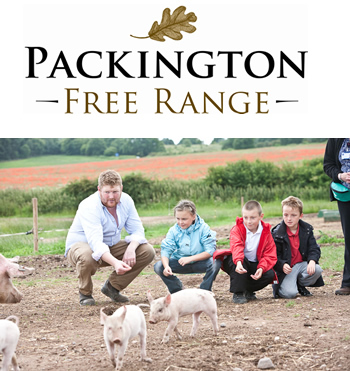 Packington Free Range is run by brothers Rob and Alec Mercer who are 4th generation farmers, who have focused their experience and passion to provide low density, environmentally sound and welfare-oriented farms. Rob Mercer, who oversees the pig business at Packington rears his pigs outdoors and the pigs will live their whole lives in the lush green pastures of our farm at Packington. They are not taken indoors to fatten up at the end of their lives, we ensure they are able to live stress-free by always providing them with what they need, when they need it. In 2007 Alec Mercer introduced the free range chicken production, just like our pigs the welfare of our chickens are our number one priority. All Packington Free Range Chickens roam free on established English pasture consisting of various grasses and clovers, with strategically placed perches and shelters offering shade, food and water, is the idyllic setting which every Packington Free Range bird experiences in its lifetime. At Packington Free Range we firmly believe that what is good for the animals and the land will naturally be good for us and better for our customers. However, your visit to our farm will not only concentrate animal production but will cover a huge range of elements such as studying the crops in our fields, exploring our ancient woodlands and discovering natural wildlife in our organic meadows. The Mercer family also own Mercer Farming Ltd a successful arable farm in rural Staffordshire which grows a range of cereals and root vegetables. Mercer Farming Ltd have introduced 52km of grass margins over the farm over the last 8 years, along with planting 16ha of native trees.